If you've been reading this blog over the last few months, you might have noticed a post that I did called: SCOM - Essential Community MPs, Scripts & Tools to Enhance Your Deployments. In this post I mentioned some excellent free tools developed originally by Microsoft's Boris Yanushpolsky that form a part of nearly every SCOM deployment I work on. I also mentioned that these tools received an overhaul by Microsoft's Daniele Muscetta to make them compatible with SCOM 2012. News just in is that Daniele has given the MPViewer tool an update to resolve some bug issues and if you haven't used this tool yet, then I'd highly recommend downloading it along with the OverrideExplorer and Proxy Settings ones. They'll save you a heap of time in the long run with your SCOM troubleshooting and deployments. Windows Server & System Center MVP Pro Speaker Series Kicks Off This Week! This week sees the beginning of an excellent series of FREE online speaker events being led by Microsoft. There will be different sessions each week and the content will vary depending on the speaker but will all revolve around Windows Server and System Center 2012. I can't wait to watch these sessions as I understand that some of them will be content that didn't quite make the final cut of presentations at MMS 2013 but will now be given the run they deserve online. This MVP Speaker Series is open to everyone and if you can't watch the sessions live, then don't worry - they'll all be made available for download as offline viewing material. If you want to get some excellent FREE Windows Server 2012 deep-dive training and are based in Ireland, then get yourself registered with Microsoft Ireland for this two day event kicking off on Monday 22nd April until Tuesday 23rd. The event sessions will be delivered by Microsoft Premier Field Engineers and MVP's alike. I'll be doing a session on Tuesday rounding up my best bits of the Microsoft Management Summit 2013 that was held last week in Las Vegas but before that, you'll be treated to sessions on Storage, Networking, Active Directory and Hyper-V (this one's delivered by 'Mr Hyper-V' Aidan Finn so you definitely want to hear what he has to say). Enjoy and hopefully I'll see you there! If you're based in Ireland and have some free time next week, then why not head down to the lovely Radisson Blu Hotel in County Cork and join Ergo for our 20/20 Vision event. This event will have sessions on ICT-as-a-Service, Azure, BYOD, Lync, Dynamics CRM and much more. I'm presenting on System Center and Windows Server 2012 in Session 1. Admittedly I'm a little belated with this post (Vegas does that to you when you spend a week there! ), however it's worth wrapping up what we did for the final days at the Microsoft Management Summit 2013 (MMS) over in the Mandalay Bay Resort, LV last week and giving people some references to the sessions that we attended. Day 4 (Thursday) was another jam packed day of back-to-back sessions that kicked off with Microsoft's Vlad Joanovic presenting a session called "WS-B318 Manage and Monitor Your Windows Azure Usage From System Center 2012 SP1". In this session, Vlad walked through some scenario's about how to best use System Center 2012 SP1 to monitor and manage your Azure workloads from on-premise. Admirably, Vlad ran nearly all his demo's directly from Azure and thankfully on the day, he didn't get hit with the internet connectivity problems that were prevalent and an unfortunate feature of MMS 2013 throughout the week. As a side note to that though, it's a credit to Vlad's presentation skills that 6 minutes into his session, the fire alarm starting going off in the building and even with the automated voiceover alert from the fire alarm and the strobe lights too, he just kept on ploughing through without even a pause! At 10:15, myself and Damian Flynn attended the "IM-B203 Building UI Add–Ins For System Center 2012 SP1 Virtual Machine Manager" session delivered by Microsoft's Jonobie Ford. This was an interesting presentation that delved into the 'not too widely known' world of SCVMM 2012 console add-ins. The demo showed a neat use case for example add-ins for Cisco UCS and HP Insight Control. This add-in delivered integration of Cisco UCS and HP Insight Control directly into the SCVMM 2012 console. As the company I work for are a HP partner, the latter example was definitely of interest and something that I think we can definitely look at deploying as a value-add to our customers. Before the next session kicked off at 12:00 PM, I took a walk over to the Expo Hall where the vendors where located and came across Dan Kregor and his cronies recording another version of the Inside Podcast Network. Before I knew it, I had a microphone in front of me and I was joining in the discussion and banter with well known System Center guru's David Allen, Matthew Long, Mickey Gousett, Cameron Fuller, Christian Booth and Mike Resseler. We had so much fun on there that I ended up missing the next session and heading straight into lunch instead! The penultimate session of the day for me was to attend "AM-B306 DevOps: Azure Monitoring & Authoring Updates for Operations Manager 2012 SP1" delivered by Microsoft's Daniele Muscetta, Marcin Jastrzebski and Brian Wren. These guys are at the pinnacle of SCOM management pack authoring and even though I'd already seen several 'DevOps' sessions during the week, I had to attend this one to see them do their thing. In this session, we were treated to a demo of the new Management Pack for Azure Fabric. This MP is a massive improvement on the older Azure one and should fill the gap nicely for those of you looking to dip your toe into Azure monitoring over the coming months. I particularly like the new Distributed Application template that comes out-of-the-box with this MP. We also had a run through on using the Visual Studio Authoring Extensions (VSAE) to author SCOM management packs and this again was interesting as it's the engine that Microsoft is pushing us to as the main authoring tool for SCOM - no more Authoring Console like in SCOM 2007. At 16:30, I attended what was to be my final session of MMS 2013. With so little sessions available the next day (Friday) and minimal time left in Vegas before we went home, we had made a decision to use the Friday for sightseeing and shopping. This session was titled "IM-B310 Troubleshooting Common System Center 2012 SP1 Virtual Machine Manager Issues" and was presented by Microsoft's John Messec , Amit Virmani, Kurt Scherer and Madhu Jujare. Here, they covered different troubleshooting scenarios and walked us through such things as ETW tracing, and troubleshooting Software Defined Networking (SDN). On Thursday night, we had the MMS 2013 closing party which was held in XS Night Club at the Wynn Resort and Casino. The venue for this event was really nice and we set ourselves up nicely outside beside the pool bar early in the evening. 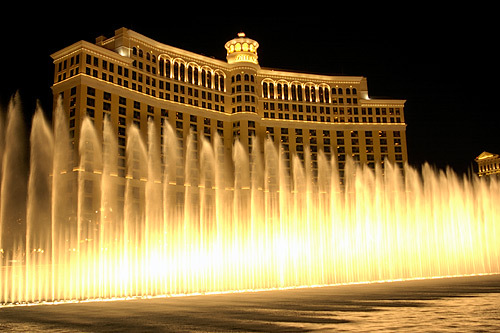 With this years venue and last years one being held in the Paris Hotel and Casino, Microsoft have really raised the bar in terms of closing parties. Let's hope that they keep this standard up for any future System Center conferences as most people I spoke to that attended said they had a great time. 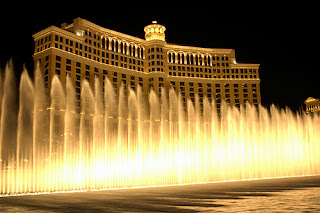 A trip to Las Vegas is never complete without doing a bit of sightseeing and as mentioned earlier, we chose to not attend any of the sessions on the Friday (there were only sessions up until 11am) and instead go sightseeing. Myself, my Irish buddy John McCabe (Microsoft Senior PFE), his boss José and Didier Van Hoye (Virtual Machine MVP and Storage legend!) all headed to downtown Vegas to check out the Stratosphere Hotel. This is one of the highest points in town and a must-visit spot for picture taking. Wrapping up the week and in reflection, out of the three MMS conferences that I've attended, this one was by far my favourite and hopefully (fingers crossed) we might have another one next year! Day 3 (Wednesday) was for me, probably the best day yet for sessions at the Microsoft Management Summit (MMS) 2013. 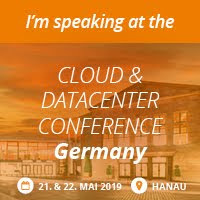 All the sessions that I attended were delivered by System Center Cloud and Datacenter Management (SC CDM) MVP's and it's these type of sessions that normally have people talking about long after the conference is finished. First up on Day 3 for me was attending an 08:30 session that was being co-presented by my fellow MVP and friend Damian Flynn. He was doing a session called "IM-B307 Early Adopters of System Center 2012 SP1" along with Microsoft's Nigel Cain. Damian and Nigel took the attendees through a number of lessons learned from their experiences in deploying System Center 2012 SP1 well before any of us had even heard of it as part of the Microsoft Technology Adoption Program (TAP). At 10:15 we attended a session by Microsoft's Charles Joy titled "SD-B309 Orchestrating Hyper-V Replica Planned Failover with System Center 2012 SP1". Charles had an excellent demonstration on utilizing Orchestrator and Hyper-V to perform planned failover of your virtual machines. Charles has also made available over 50 Orchestrator runbooks that you can download now that form part of this session. The relentless sessions just kept on coming and at 12:00 we had Cameron Fuller, Chris Ross and Jason Sandys present one called "IM-B317 Provisioning in System Center: Users, Groups, Virtual Servers, Software and More!". This session had possibly one of the most fun openings of the week and they did a role-play type intro whereby the threw down a challenge to the best method to provision different resources - either manually or automatically with System Center 2012. This session also showed us an excellent customization of the System Center 2012 Service Manager (SCSM) Self Service Portal (SSP) that surely now opens up the boundaries for what we can do with the standard (and not very cool) SharePoint Foundation SSP. After a lunch meeting with our book publisher, we looked forward to another round of MVP driven sessions. At 14:45 it was into a session with Cameron Fuller, Gordon McKenna and Sean Roberts called "SD-B313 Effective Capacity Planning of Your Infrastructure Resources". This was an excellent session where the highlight was when Sean started working with OLAP cubes to mine data from the SCOM datawarehouse and use it with Performance Point to generate capacity planning reports and dashboards on the fly. There was also some short slots for a number of vendors to showcase their wares around the capacity planning space. The last breakout session of the day was delivered by Maarten Goet and his one was called "IM-B316 Monitoring and Managing the Network and Storage Infrastructure with Operations Manager 2012". In this packed session Maarten used his excellent presentation skills to show everyone the capabilities around network and storage monitoring in SCOM 2012 SP1 whilst leveraging the SCVMM 2012 SP1 integration and management packs. Once the breakout sessions ended for the day, it was time to attend some Birds of a Feather sessions with the other MVP's and Microsoft product groups. These sessions allowed the audience to ask any question they liked on System Center 2012 (excluding SCCM) and we got some really good questions with some equally good answers. When they were finished, it was off to a meet and greet with some of my online System Center community friends and then (as you do) we went to the onsite Irish bar in the Mandalay Bay for some food and a few well deserved drinks! It was another excellent day at the Microsoft Management Summit (MMS) 2013 yesterday (Tuesday). This year for me, the conference is truly showing its value in terms of networking and meeting up with other members of the System Center community. First up was a session titled "WS-B321 Microsoft Private Cloud Fast Track v3: Private Cloud Reference Architecture Based on Server 2012 and System Center 2012 SP1". This session delved into the Microsoft Fast Track program and went through the private cloud reference architecture and where it fits in with Windows Server 2012. The next session of the day for me was "WS-B329 Getting Started with Windows Azure Virtual Machines and Virtual Networks" which was delivered by Microsoft's David Aiken. The challenge for the presenter here was that the internet connection kept dropping off and when you're trying to demo a cloud based Azure solution, that's kind of important! To be fair though, he quickly changed over to his 'Plan B' internet and ran the demo from his phone hotspot! Once he got going, the session went into deploying VM's into Azure and was quite interesting. The last session before lunch that I attended was another Azure one titled "WS-B331 Windows Azure and Active Directory". Microsoft's David Tesar presented this one and promised that it wasn't going to be a Level 100 overview of Azure. He stayed true to his word and went into his slide deck and internet based demo's in great detail. I enjoyed this one for sure. After lunch, I was due to attend two sessions on "How to Design and Configure Networking in VMM and Hyper-V" with my Irish sidekick John McCabe (Microsoft Ireland Senior PFE), but ended up getting asked by my MVP colleague Christian Booth to talk with himself, Marcus Oh and Dan Kregor on the Inside Podcast Network about our experiences of MMS so far. This for me is by far the highlight of MMS as I regularly listen to Dan and his cronies (guests) on their monthly podcast. I've had a chance to take a quick listen to some of the podcast and it sounds excellent and that's a credit to Dan (and big thanks to Rod Trent of MyITForum.com) for making it happen at this years event. Even though on Sunday, we had registration and a couple of sessions, the day that the keynote speech starts is the day that most people count as Day 1 here at the Microsoft Management Summit (MMS). This is a quick post to bring people up to speed about what went on over here yesterday (Monday 8th April) and a primer for what's going on today (Tuesday 9th April). At 09:00 yesterday morning, all 5000 plus attendees were packed into the Event Center in the Mandalay Bay Hotel. This was a far better room to host the Keynote speech than the ballroom that hosted it at this event in this same hotel back in 2011. When we arrived at the Event Center, we were greeted with some cool tunes from Microsoft's Joey Snow and even though there were some WiFi issues throughout that hotel at the time (for a room full of nerds, this was a Major problem! ), he kept us all occupied with his choice of music. The Internet being down across the hotel was a blocker for the Keynote starting at it's original time of 08:30 (all the demo's had to run with Internet connectivity) but once they got the problems sorted, Brad Anderson - Corporate Vice President of Program Management in Microsoft’s Windows Server and System Center Group (WSSC) - came onstage to do his thing. With a set of breakthrough new products and growing industry momentum, Microsoft is transforming IT management. The new capabilities of Windows Server 2012 with System Center 2012 SP1 enable customers to build and manage elastic infrastructures while reducing complexity, improving deployment of critical applications, and advancing the consumerization of IT. In this keynote session, Brad Anderson will demonstrate how Microsoft technologies deliver new cloud capabilities, and he will showcase how customers are already realizing gains in productivity, growth, and innovation through Microsoft solutions. It's that time of year again when the Microsoft Management Summit 2013 kicks off in Las Vegas for a week of System Center sessions, community networking and of course a little fun (it is Vegas)! I've been lucky enough to be able to attend MMS 2011 and also MMS 2012 and coming back here for MMS 2013, I sure feel like a veteran now! The week ahead for us attendees is packed full with sessions, instructor led labs, certification tracks and meet and greets. Yesterday (Sunday) saw us register for the event (the registration process was a million times more efficient than last year's madness) and receive our swag which included a new laptop bag, a handy little zipper case for packing our power supplies, a pen, a 1GB USB key, a notebook, an MMS 2013 badge and a flashing necklace light which doubles up as our MMS 2013 closing party access key. Although I'm not a huge fan of the bag this year (it's more to do with my own personal dislike for those type of laptop satchels than the actual quality of the bag itself), I've spoken with some other attendees and they're more than happy with it. After registration there were a small number of sessions available to whet our appetite for the week ahead and myself and Damian Flynn headed into a session on "Updating 3rd Party Applications with System Center". The session was pretty cool and demonstrated how to use SCUP and SCCM to maintain your non-Microsoft applications - such as the never ending update app Java! When we finished with that session, it was into a really cool private meeting between the attending System Center MVP's and Microsoft's Brad Anderson. I'll try to keep the blog updated over the coming days so stay tuned!